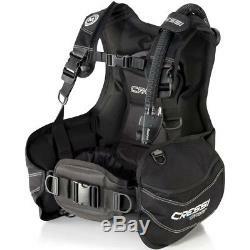 Cressi Start Scuba Diving BCD. Cressi Start BCD, LP Inflator Hose and Owner's Manual. If you're looking for a durable, strong and almost bulletproof BCD jacket than the Start is what you are looking for. Constructed from extremely Strong 500 and 1000-Denier Cordura, with excellent buoyancy, even on smaller sizes the Start full jacket BCD fits the bill. Designed with the demanding use of dive training and rental facilities in mind this BCD will give the sport diver years of dependable use. The BCD has three over-pressure relief/dump valves with two located on the left and right shoulders and a third lower valve on the rear right of the air cell. All three can be manually dumped two with pull cords and the other with the power inflator mechanism. There are two plastic D-rings and two additional snap hooks for attachment of instruments and accessories. If used at dive facilities a size indicator is highly visible on the right shoulder. BCD has two large accessory storage pockets with hook and loop closures, and the adjustable sternum straps along with both torso adjustment and waist straps are equipped with squeeze-style side-release buckles for easy donning and doffing. The waist strap/cummerbund assembly is independently suspended from the air cell allowing the air cell to inflate away from the diver preventing the squeeze-effect when inflated. The backpack is rigid for support and stability of the cylinder yet is fully padded for comfort. The Cressi Start BCD come with a 3/8 threaded quick-disconnect low-pressure hose and owner's manual. / kg / size 29.2 lbs. / 13.3 kg / XS 31.5 lbs. / 14.3 kg / S 33.7 lbs. / 15.3 kg / M 38.1 lbs. /17.3 kg / L 44.9 lbs. / 20.4 kg /XL. Designed Primarily as Rental BC for Resorts and Dive Schools. Strong Enough to Rent Bullet-Proof Construction for Recreational Divers. Stability of a Jacket Style BC. 1000 and 500 Denier Cordura Construction. Large, Easily-Seen Size Markings on Shoulder. 2 Large Cargo Pockets with hook and loop Closures. Plastic D-Rings for Accessory Attachment. Rigid Padded Backpack and Carry Handle: Stability and Ease of Transport. Buoyancy Control: 3-Exhaust/Overpressure Relief Valves 2-Vlaves with Pull Dump Handle (Right Shoulder/Lower Rear) Cressi's Power Inflator with Cable Activated Pull Dump 3/8 Threaded Low Pressure Quick-Disconnect Hose. Adjustable Waist Strap with Cummerbund Pad for Comfort. All Straps Equipped with Squeeze-Style Side-Release Buckles for Quick-and-Easy Donning and Doffing. Lift Capacities: 29.2 lbs. (13.25kg to 20.4kg) Size Dependent. (13.25 kg), SM; 31.5 lbs. (14.29 kg), MD; 33.7 lbs. (15.29 kg), LG; 38.2 lbs. (17.33 kg) XL; 45 lbs. 2-Pockets w/Hook and Loop Closures. Adjustable Torso Straps w/"Squeeze-Style" Side Release Buckle. Adjustable Waist Strap w/"Squeeze-Style" Side Release Buckle and Cummerbund Pad. Yes, Adjustable Sternum w/"Squeeze-Style" Side Release Buckle. Cressi Power Inflator w/Cable-Activated Pull Dump. 1000 and 500 Denier Cordura. Feedback is a very powerful tool. It gives sellers a reason to conduct business at the highest level of honesty & respect. Many years ago Leisure Pro was the first Internet-based divers supply company. We're still the number one store for scuba diving and snorkeling equipment. Thousands and thousands of satisfied customers swear by our service. Hours: Mon-Thu: 9:30-5:30, Friday: 9:30-12:30. Please do not request to have an item relisted if you do not see it any more. If we are able to relist, we will do so even without your request. We will not mark any package as a gift. You will get that automatically. Then, we give another 90 days (120 days from the date of invoice) to return for store credit. We won't even ask why you've changed your mind. Please wait 8 days from date we received the package for us to process your return. The item "Cressi Start Scuba Diving BCD" is in sale since Wednesday, September 19, 2018. This item is in the category "Sporting Goods\Water Sports\SCUBA & Snorkeling\Buoyancy Compensators". The seller is "leisurepro" and is located in Elizabeth, New Jersey.